After several days of spring, we have managed to double our 2019 Top 5 bass total. We now have two fish entered with the latest one only making the 12” bass cut by a fraction of an inch. But hey, after a long winter, this fisherman will take anything he can get. And you’ve gotta start somewhere. No disrespect to this much appreciated catch but hopefully it will be displaced before the year is over. Actually, I’m hoping it will be displaced once April arrives. Stay tuned for that adventure next week and for now take a look at our second Top 5 Update of the year. Angler Comments: I would have put my money on a jig or my Shad Rap but it was a spinnerbait that pulled this one out of about 3’ of water around some shoreline brush for my first bass of 2019. As an added bit for today’s Top 5 Update here is a video clip that I shot as part of the intro on my way to the fishing hole. 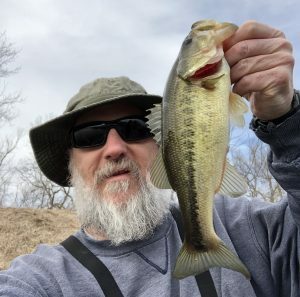 It was about time that I got a bass in the ledger for 2019 for more reason than simply a rough winter.